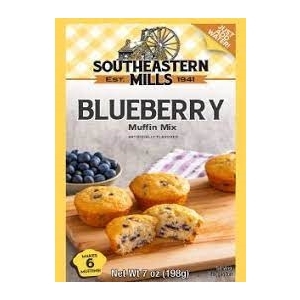 Southeastern Mills Blueberry Muffin Mix is so easy to make, just add milk! Light, fluffy muffins with artificially flavored blueberry bits. Makes 5 muffins. Recipe variations on package! Preheat oven to 400 degrees. Combine muffin mix with milk. Mix just until smooth. Fill 6 lightly greased muffin tins 2/3 full. Bake 11 to 13 minutes or until golden brown and toothpick inserted in center comes out clean. Bleached enriched wheat flour (wheat flour, niacin, reduced iron, thiamine mononitrate, riboflavin, folic acid), sugar, artificial blueberry nugget (dextrose, corn flour, partially hydrogenated vegetable oil (soybean, cottonseed), sugar, water, citric acid, artificial flavor, and artificial colors (FD&C blue #2 and FD&C red #40 dye)), shortening powder (partially hydrogenated soybean oil, corn syrup solids, sodium caseinate, mono and diglycerides, dipotassium phosphate, sodium silicoaluminate, soy lecithin), yellow corn flour, leavening (sodium bicarbonate, sodium aluminum phosphate), soybean oil, salt, whey, whole egg solids (dried whole eggs, corn syrup solids, salt), nonfat dry milk, methylcellulose, soy lecithin (nonfat milk, soy lecithin, partially hydrogenated soybean oil), artificial flavor. Allergy Information: This product contains wheat, egg, milk, soy and wheat.